Fourth Annual EMPORIUM Fundraiser is Saturday, November 1, 9-2. 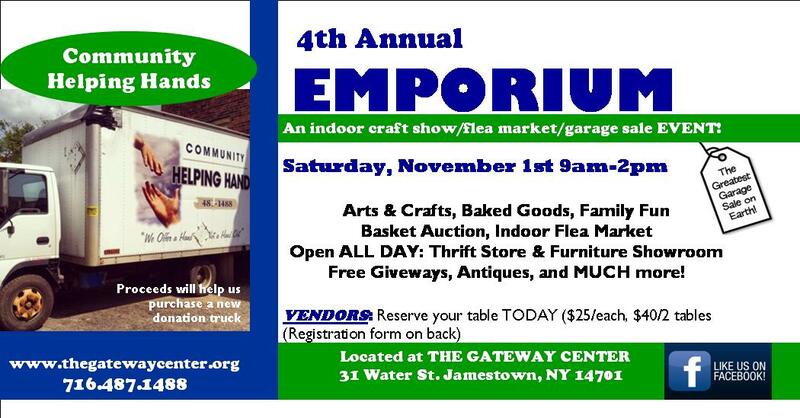 Join us for the fourth annual EMPORIUM, a craft show / flea market / rummage sale event! This fundraiser includes activities for kids, food and crafts, free giveaways, and the best gift basket auction EVER. Saturday, November 1 from 9-2. Vendors, reserve your table now ($25 or two tables for $40). This year, all proceeds go towards the purchase of a new donation truck! Please call (716) 487-1488 or email office.chh@gmail.com for more information.